...the time has arrived. Despite being very tight on time, I have managed to snap some pics along the building process, which I really hope you will enjoy as much as I now enjoy the finished product! Bone-stock form... that will soon change! As soon as I got the wagon home, I fixed a vacuum leak that prevented it from shutting off with the ignition key. It's enormously inconvenient to have to open the hood every time I stop somehwere! Excellent Mercedes engineering. In all the digging, I did not find a single plastic component! You need to listen to this song to continue. 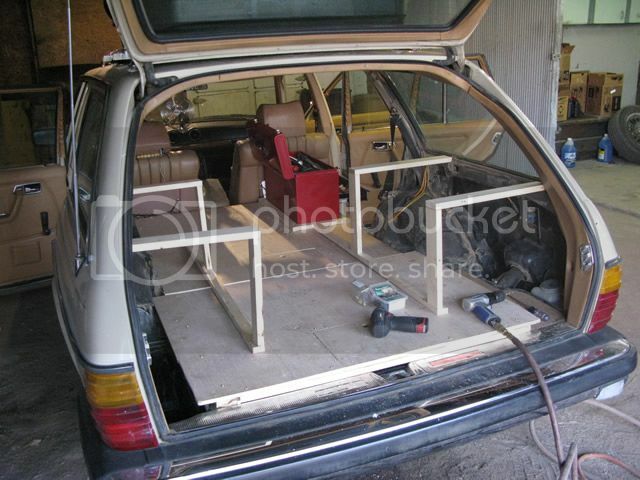 Armed with my socket set and my trusty ratchet, I took apart the second-row and third row seat, practically gutting the entire interior and exposing all the useable space I would be working with to create the living space. Be very careful with the sharp metal borders! The next thing I did was to swap all four window regulators from electric to manual. 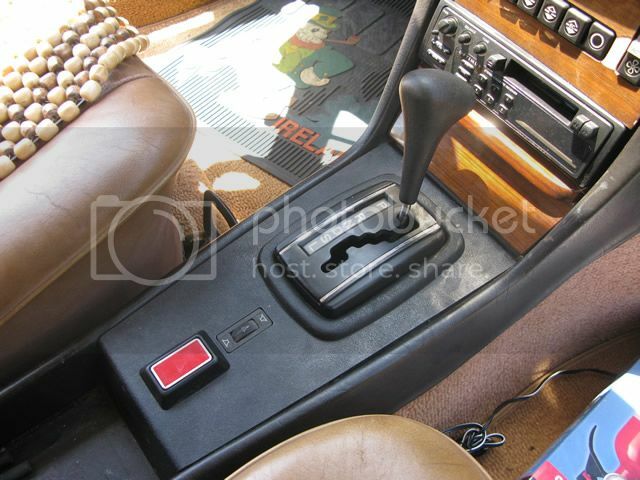 It is just plain common sense to want to crank down the window while the key is not in the ignition. This reliable system will not cause problems if, say, the electric motor malfunctions. This console was pulled from a Mercedes 240TD that was killed by a tree! With everything apart, it's an excellent time to clean everything up. Because the car had been driven in Kansas dirt roads most of its life, I found fine traces of sand and dirt EVERYWHERE in the car. In some cases it was so bad I had to rinse all of it off with a garden hose. Now, ready for some heavy-duty upgrades! The basic stuff was done. 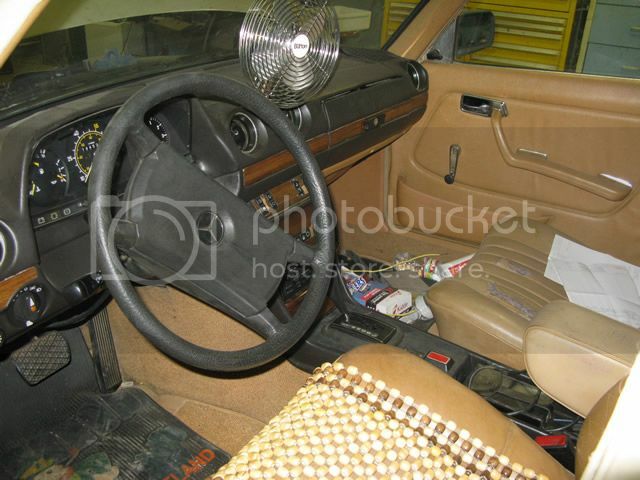 The car shut off, had crank windows, and was ready to be built. Now it was time to get it to David, my trusty mechanic, about 30 miles Northwest of Wichita. I made a list of all the heavy mechanical fixes and upgrades to leave to his competent hand and took off to shop for a few supplies: interior amenities, plenty of wood and a few containers. The shopping list was actually not as short as I imagined it to be. 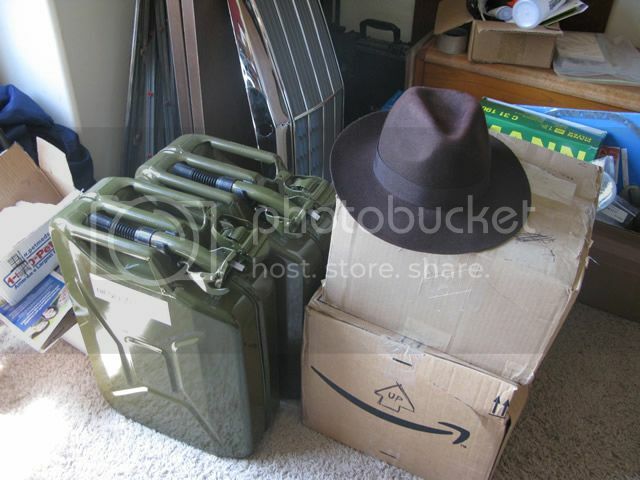 In addition to the first aid supplies detailed in the previous post, I got two 5-gallon jerrycans, a 3.5gallon heavy-duty sprayer –best overland shower ever made–, a dash fan, a compass, a roof storage carrier, a safe, seat beads, and all the Mercedes spare parts and consumables you could ever imagine (behind the boxes), many of them obtained thanks to the generosity of Peachparts members. You choose: to fix the A/C for $1,000 or to install a $30 fan. Back at David's things were making huge progress. Not only the fan was rigged without visible chords, but most of the maintenance under the hood was complete. 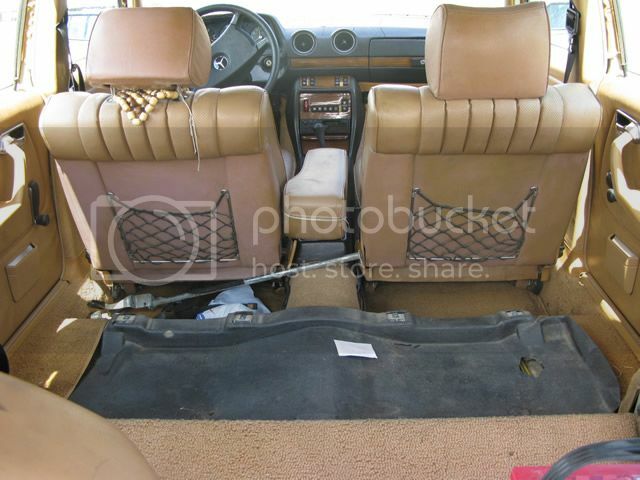 The next things on the list were the suspension upgrades, the cargo carrier, and a leak from the transmission. 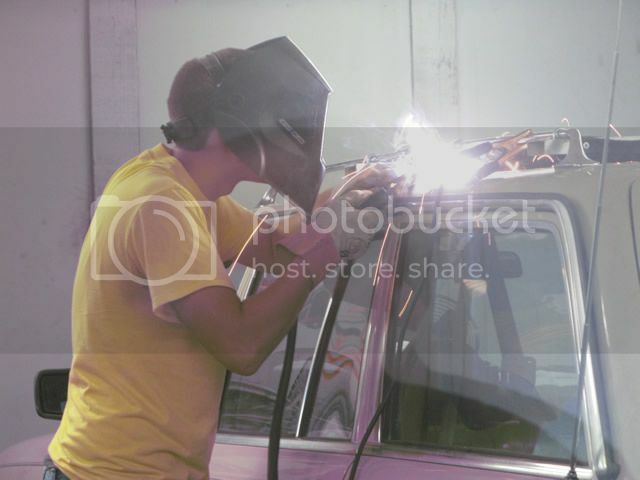 David's apprentice, welding the cross-members for the cargo carrier. For the suspension, I used Mercedes S-Class springs (W140) in the back, which provided almost a fist's worth of extra height. 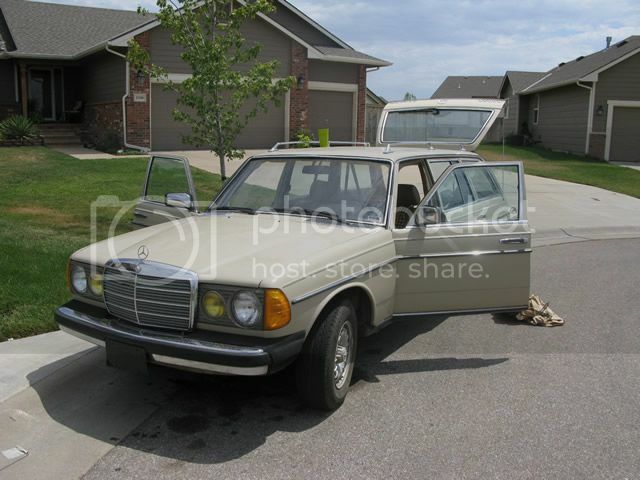 The front ones were Mercedes 280E rally springs, purchased from the symbolic amount of $10 from a Mercedes forum member. All of these were paired with Sachs and Bilstein heavy-duty (taxi style) shocks. The rooftop carrier would be bolted to a welded set of crossbars on top of the car, just in case a random stranger felt curious about its contents. 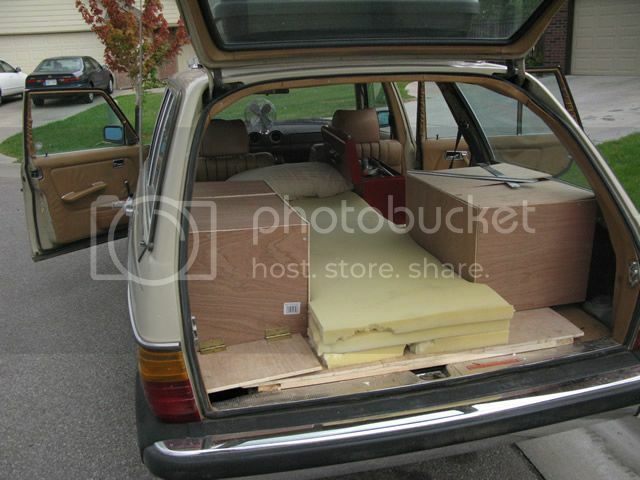 Never underestimate the power of a W123 Mercedes wagon! With all the health and research-bound preparations done, I headed to Lowe's for some materials to build my living cell. With a very specific plan in mind, choosing the right board sizes was no problem at all. 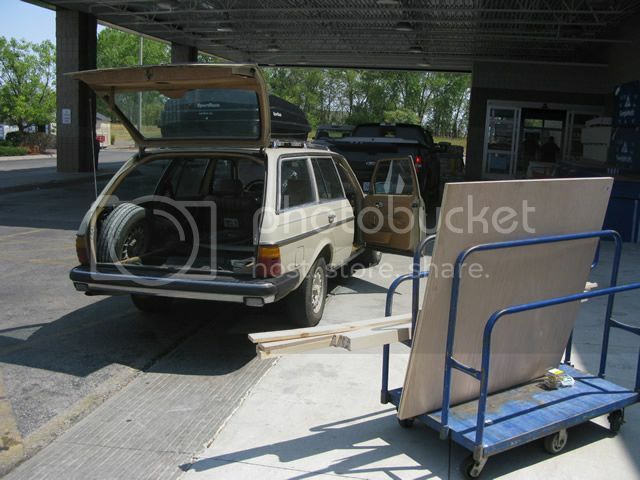 I got a HUGE kick out of all the surprised looks of big truck owners, flabbergasted as my harmless-looking wagon pulled into the loading deck and loaded the wood effortlessly! Self-tapping, wood-to-metal screws all around! David let me use the shed next to his garage to build the living cell. The armature was a piece of cake. The biggest pain was to get all those screws in, with my lack of brute strength and with the metal being so soft. 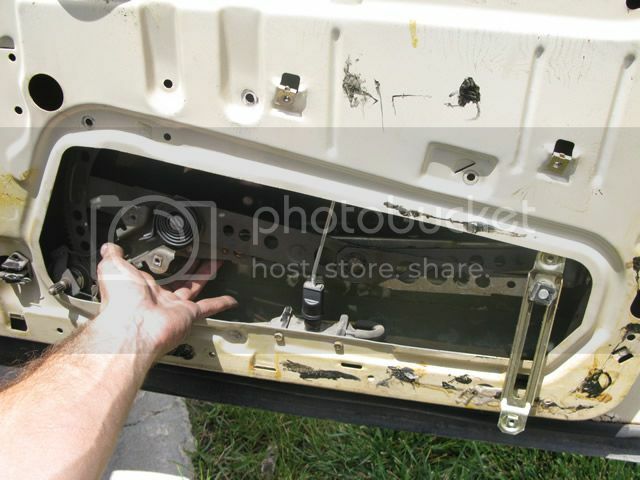 At this early stage, I bolted down a small safe to the body of the car. The living space is beginning to take shape! 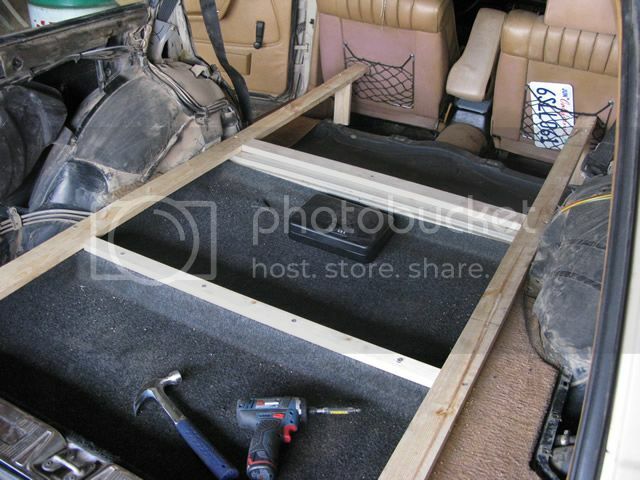 As soon as the armature was set, I customized two large wooden boards and gave them openings for storage underneath. Then, with the help of David, I built the armatures for the storage boxes and screwed the main beans to the metal walls at the sides. We broke two drill bits in the attempt! My future home for the next few months, what a scary –yet exciting– thought! It took me seven to eight hours to build the entire living quarters from start to finish. I wouldn't have been able to complete it had it not been for David's punctual assistance hand and all his power tools. David Long, if you are reading this, thank you once again to you and your family for tolerating my noisy saw operation after sunset, and for everything preceding this mess! 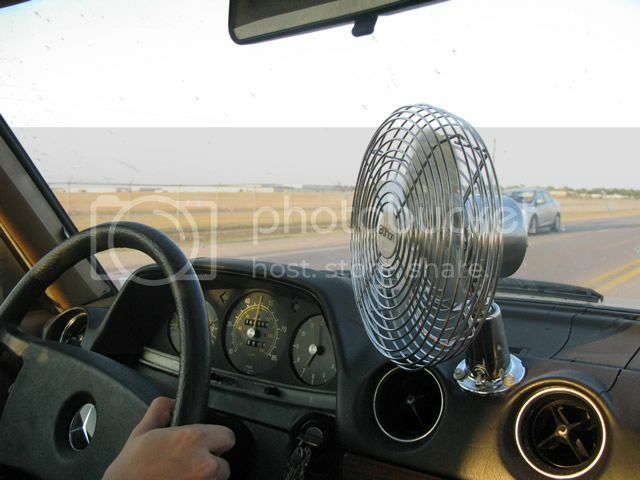 Fan working wonderfully, driving with all my belongings in the back! The last tough to the living cell were to clean all the sawdust and cut down a foam mattress topper and layer in in the center. Everything that followed was sheer stashing on my stuff in the back! I am happy to say that everything fit perfectly and the suspension did not complain, as everything I own does not weight too much. The car runs wonderful and can do 75mph without shakes! The next post will narrate the first thousand miles of this epic journey, from Wichita to San Luis Potosí. Until then, stay tuned and please subscribe to the Facebook version of This European Life for short, more frequent updates! My prayers go out to you Miguel. I wish a smooth and enjoyable trip for you. I am happy I could help out with your trip. I envy your excursion and wish I could embark on one myself. If you have any mechanical questions along the way, feel free to send an email and I will help where I can to answer them. Onward with your journey! Any other photos of the 'finished' project? The second-to-last pictures comes close, but I will take a few pictures next time! Thank you for your comment! The Mercedes-Benz A-Class is a compact car produced by the German automobile manufacturer Mercedes-Benz. 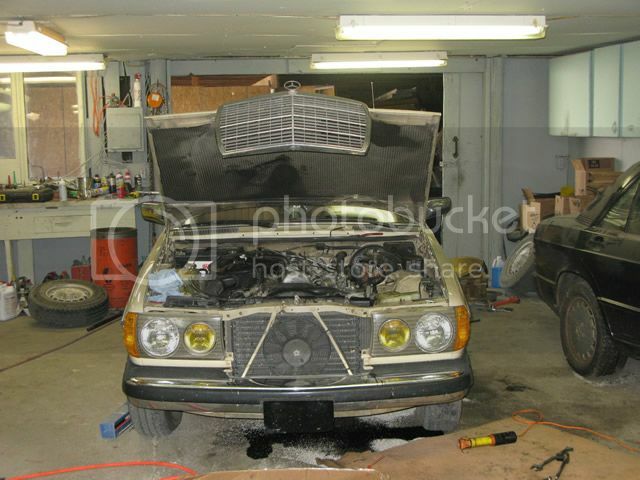 This auto repair manuals free for Mercedes is available in the manuals.co website.